At Tuesday evening's meeting, TESPA's hydrogeologist, Doug Wierman, explained the details of BSEACD's May 21st staff recommendation, which proposes that the BSEACD Board of Directors issue EP a permit with phased in volumes of production and special conditions that are designed to avoid and mitigate impacts to the aquifer and landowners' wells. EP must now publish notice of BSEACD's recommendation and has until June 5 to do so. Once EP publishes notice, the public will have 20 days to submit comments to BSEACD or to submit a contested case request. Read about process here. At the meeting, TESPA's Executive Director, Vanessa Puig-Williams, announced that TESPA plans to contest EP's permit and is asking landowners who will be impacted by the project to join TESPA and become a part of the contested case. Over fifty landowners have joined this effort so far. 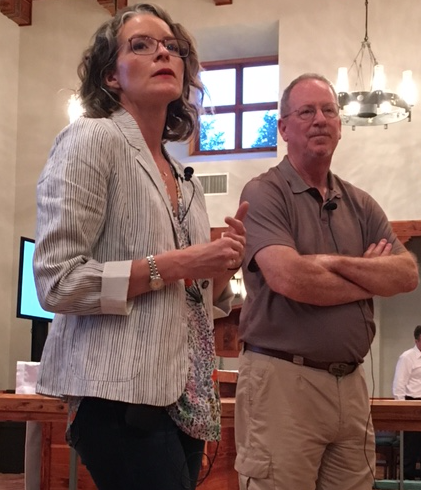 Puig-Williams explained at the meeting that TESPA has decided to protest EP's permit because TESPA believes that BSEACD's recommendation does not protect the property rights of landowners near EP's well field whose groundwater will be drained by EP's pumping. Despite the phased in production volumes and pumping curtailment requirements, drawdown will still occur. EP will be pumping other landowner's groundwater and selling it for a profit. This cannot stand. Both the courts and the Legislature have held that landowners own their groundwater in place. While it is true that BSEACD has recommended measures that are designed to avoid or mitigate impacts to landowners' wells, Puig-Williams emphasized that there are many landowners who do not own wells whose groundwater will still be drained and those who have wells will have to go through a burdensome process to have EP lower the pump on or re-drill their well just so that EP can pump and export water that does not belong to them. 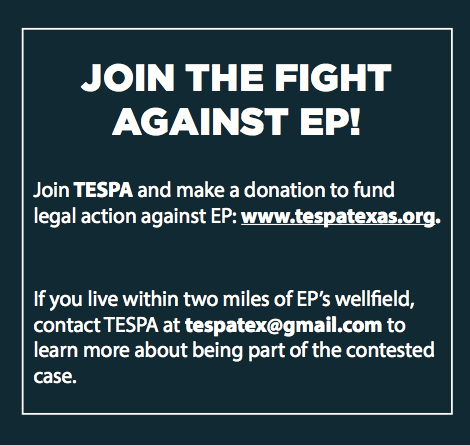 TESPA attorney, Jeff Mundy, also voiced concerns over the fact that BSEACD's recommendation provides no emergency protection for landowners' whose wells go dry once EP starts pumping. Under the staff's recommendation, it could be at least 30 days before EP is required to respond. TESPA's President, Jim Blackburn, delivered a video address to the crowd urging landowners to join him and TESPA in the fight to stop EP's efforts to steal our water. Click here to view the video. Former County Commissioner Will Conley who was instrumental in the passage of House Bill 3405, which brought this previously unregulated area under the jurisdiction of BSEACD, made comments last night about the significance of having. a process which EP and BSEACD must now follow under BSEACD's rules. Commissioner Conley's words are very true - it is this process brought about by passage of HB 3405 and the hard work of area landowners that gives landowners a voice and an opportunity and procedure to protest this proposed permit. There are three things you can do if you want to help. 1. Donate to TESPA to fund the contested case action. 2. If you are a landowner who will be impacted by EP's request, join the effort to contest the permit. Email tespatex@gmail.com with your address and phone number. 3. Submit comments to the BSEACD Board of Directors by the 20 day comment deadline (exact date will be known any day). By next week TESPA will post some suggested comments on our site for landowners to use as a template with instructions on where to send comments.